Image edit in Affinity designer doesn't show when you export to PDF. I've posted a similar issue here before but now it seems Affinity Designer won't export PDFs properly. When I apply the transparency tool on an image in Affinity Designer and then export it (using the default PDF (For Print) the transparency effect is gone in the PDF exported. I have to flatten the PDF in order for this to work. Not sure what I'm doing wrong. 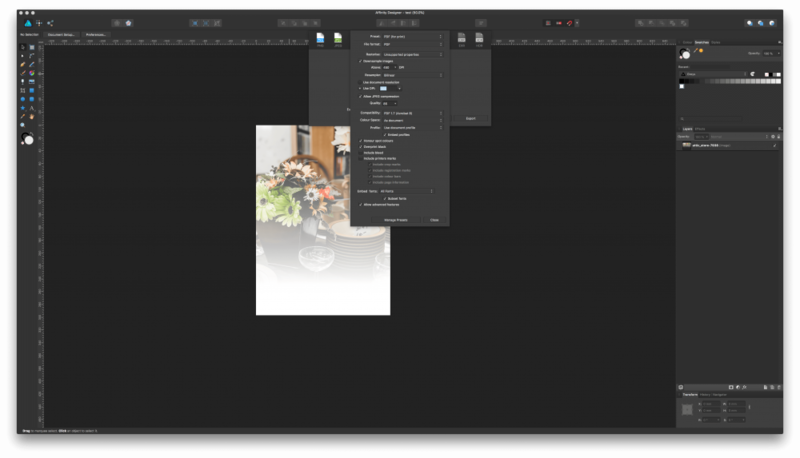 I've reproduced the issue here and it looks like it is being caused by the 'placed image' type of layer. If you right click that layer in Affinity and select 'Rasterize' it will turn it to a 'Pixel' layer, and when a transparency is applied to that it is outputting to PDF correctly. I'll get this passed on to development!